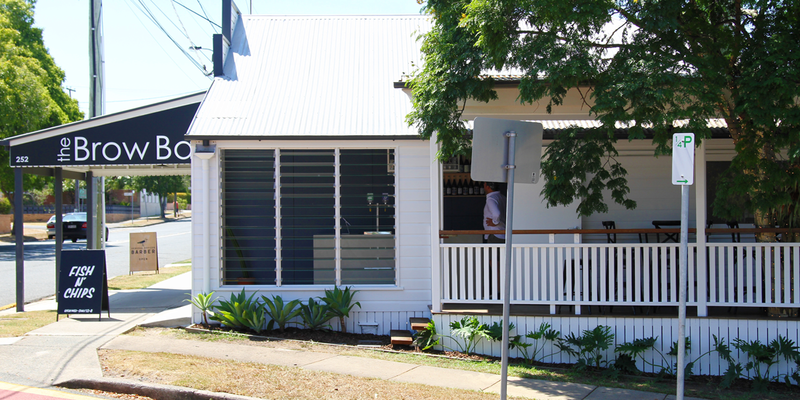 For the past two years, Jen Byrnes and Patrick Laws have been running one of Brisbane’s favourite suburban eateries in Martha Street Kitchen, so when we caught wind that the duo were on the cusp of opening up a new venture in the heart of Coorparoo, we set a course immediately. The talented tandem are mere hours away from opening Perch’d tomorrow, Saturday January 26 – a modern fish and chippery that is looking to deliver a considered take on the cuisine without reinventing the reel (pun intended), served with a side of casual-cool atmosphere. If you ask Jen Byrnes and Patrick Laws, the idea for Perch’d originated through happenstance. As locals of Brisbane’s southeast and operators of Camp Hill’s Martha Street Kitchen, the duo have become in tune with the movements and needs of the area. Their daily commute frequently saw them drive past an unassuming and available corner tenancy on Cavendish Road – the former home of poky cafe pit stop Coffee 252. Despite its diminutive dimensions, Jen and Patrick saw potential in the space, which boasted a covetable deck overlooking York Street. The wheels of inspiration turned, momentum built and soon the duo were signing on to take over the space, their minds buzzing with ideas of a fish-and-chip joint that offered a charming interplay between heady nostalgia and sharp modernity – the classics, but elevated. Thus, Perch’d was born. Over five months Jen and Patrick gradually reworked the space. 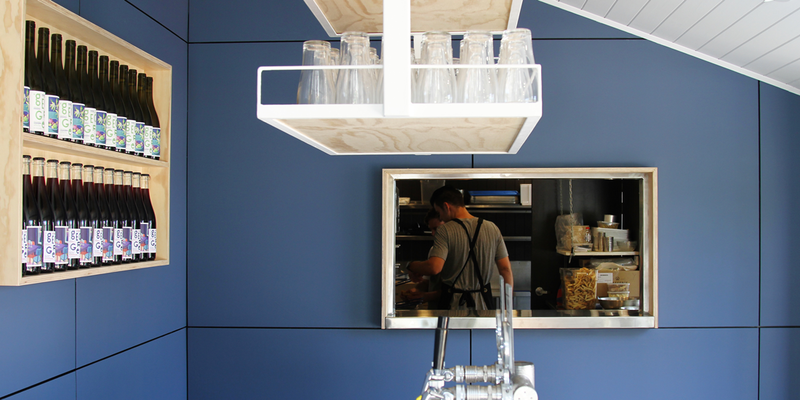 The kitchen was expanded and overhauled with new gear designed to pump out orders in record time, while the entry portion was fashioned to hold an order counter and bar. With limited room, minimalism was the go – the entry boasts a simple rendered concrete bench, shelves for wine and glasses (made by Bare Joinery), and two beer taps. Those dining in at Perch’d will need to pick a spot on the deck (which can also be hired for functions), where new tables (also made by Bare Joinery) and upcycled chairs offer prime position to catch errant breezes blowing by. At the helm of the kitchen, Patrick isn’t going in blind as far as knowledge of the fish-and-chip craft is concerned. Patrick started his culinary career as an apprentice at fish and chipperies before graduating to restaurants, retaining his feel for the concept and what makes it great. For Perch’d, the duo is opting for a classic feel but with some deliberate enhancements. This means sourcing top-tier ingredients and serving in an uncomplicated manner where the key flavours and components – salt, acid, sweetness – interplay in a lively manner. 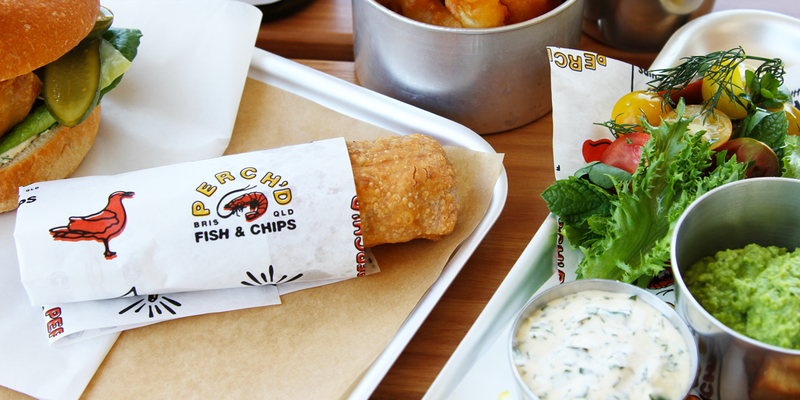 For the Perch’d crew it all starts with gaining access to good seafood. Jen and Patrick liaise with wholesalers to get a sense of the best seafood of the moment, staying well informed so they can make the best choice when sourcing from the trawlers. The menu caters to dine-in and take-away eaters, with a selection of four fish (whiting, barramundi, snapper and salmon) available upon launch. Each selection can be made into a meal complete with fresh salad, thrice-fried and hand-cut chips and sauce made in house. The menu also features fish burgers, veggie burgers and chip butties, as well as a host of nostalgic sides such as prawn cutlets, house-made Chiko rolls, mushy peas, potato scallops and battered pineapple. In a couple of weeks Perch’d will also fire up its soft-serve machine, offering two rotating flavours (and one mixed flavour) for a sweet finish, while weekly specials will see the kitchen tackle the likes of octopus and prawns. As for the drink, Perch’d is keeping things concise again without sacrificing quality. The two taps are currently pouring ales from Green Beacon Brewing, but will offer rotating drops from other craft outfits in the future. Diners can select from two natural wines – an aromatic and citrusy white or a juicy chilled red – both from small-batch Victorian label George Wines. Perch’d will open officially tomorrow Saturday January 26 at 12:00 pm. For more information, check out the Stumble Guide.